Many young people come to Taizé every year, but how can they be encouraged to pray and work with others in the places where they live? The notion of a pilgrimage of trust wants to address this concern by proposing to each person to set out... "Walk forward on your way, because it exists only by your walking. " During the stages of the pilgrimage of trust, whether big or small and international or local, the participants and their hosts are first invited to encounter others. Sometimes families have welcomed young people from a country that was at war with them a few years ago. Hospitality lived in great simplicity breaks down many barriers and prejudice. This was striking during the meetings in Zagreb, Sarajevo, Cochabamba and Nairobi. Following a meeting in Porto, a young man wrote: "The pilgrimage is an event for those who make it, those who dare to leave their homes and risk failure, but also for those who receive guests and discover that they receive much more. Thousands of young pilgrims have joined thousands of people who have agreed to open their homes to strangers. They shared more, much more than their possessions; they shared their lives, their beliefs, their hopes." The pilgrimage of trust is first of all a meeting; with the Risen Christ and with others. Thanks to the times of prayer together, we make ourselves available for God. Through sharing and hospitality, everyone agrees to overcome barriers and differences in order to welcome and enrich one another. For Brother Roger, it was essential not to organize a movement around the community. 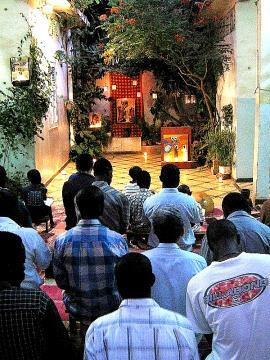 On the contrary, after taking part in one of the stages of the pilgrimage of trust, each person is invited to go home and live out what he or she has grasped of the Gospel; and to do this with an increased awareness of the life that dwells within them and of the practical gestures of solidarity they can put into practice in their own immediate environment. 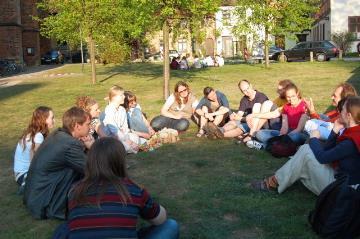 In many countries, young adults come together on a regular basis for prayer with songs from Taizé, while remaining in touch with the reality of the local Church. 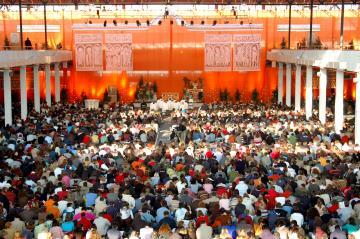 When the meetings in Taizé permit, brothers go off to visit these young people, to support them in their quest. These meetings are like small steps in the pilgrimage of trust; they make it possible to deepen our commitment together in the Church, and to visit local Churches. The brothers wish to support the search for peace and reconciliation wherever it exists. At the end of each year, between Christmas and New Year’s Day, a very large meeting is held in one of the major cities of Europe. In Asia, Latin America and Africa international meetings are also held regularly. Some of the brothers live far away from Taizé, mainly among the very poor; they work among prisoners in Seoul, South Korea, bring relief to the disabled in Bangladesh, welcome numerous children in Senegal and Brazil, lead youth meetings in Kenya…. The existence of these “Taizé houses” is based on prayer and fraternal life.